14 year-old Ellis lives on a makeshift houseboat on the banks of a river in Arkansas with his parents, Mary Lee and Senior. He sneaks out early one morning to meet his best friend, Neckbone. Neckbone, also 14, lives with his uncle, Galen , who makes a hardscrabble living diving for oysters. The two boys set out to an island on the Mississippi River, where Neckbone has discovered an unusual sight-a boat, suspended high in the trees, a remnant of an extreme flood some time in the past. They climb the tree and into the boat only to find fresh bread and fresh footprints. Realizing that they are not the only ones who have discovered the treehouse boat, they decide to leave. When they reach the shore, they find the same footprint in their boat. And that’s when they meet Mud . Mud is a gritty, superstitious character; his clothes are dirty, his tooth is cracked, and he needs help. “Mud” is like the procession of Echternach, but with 5 steps going forward. So not that painfully slow. 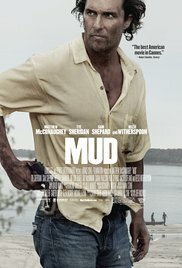 Although it’s limited to 10 minutes of “more movement” in the end, this movie still continues to fascinate because of the engaging conversations and magnificent images of the Mississippi. The thread throughout the entire film is the trust that Ellis (Tye Sheridan), a boy who’s at the intersection to adulthood, has in Mud (Matthew McConaughey), a fugitive who apparently killed someone who ruined the life of his childhood sweetheart Juniper (Reese Witherspoon). Mud is hiding in a motorboat, high in the trees, which the boys discovered on a deserted island. They help Mud to collect components, even a complete engine, for the boat. And that’s unfortunately the main part of the total film. The two rascals moving back and forth to the island. The trust that Ellis has in Mud, comes from the fact that he demonstrates a honest love for Juniper (limited role by Reese Witherspoon and she still has an angelic appearance). Something Ellis is missing at home because of the impending divorce of his parents, resulting in the loss of the houseboat. This trust disappears when Mud is too cowardly to tell Juniper in person he’s going to leave her and Ellis has to do the job by handing over a note. Another story line is the flourishing, but unrequited love from Ellis for the older Pearl May (Bonnie Sturdivant). And there’s in the end that moment when all bounty hunters show up in the town to hunt down Mud. That’s it in a nutshell, with a fairly action-packed and predictable ending. What fascinated me about this movie? The interactions between the two boys. The efforts of the parents of Ellis and uncle Neck Bone to provide a minimum livelihood. And the peace conveyed in this movie thanks to the frequent images of the quiet rippling Mississippi. Several times I found the dry conversations, with a total lack of emotion, between two adolescents hilarious. Subsequently it turns into a mature tone when conversing with the older people. Therefore I think it’s a brilliant performance of Tye Sheridan and Jacob Lofland. Matthew McConaughey is a colorless figure. And two things that struck me was : a total lack of food, but cigarettes he apparently had enough. And he looks unwashed with his scruffy hair, beard and dusty appearance … but that shirt remains dazzling white throughout the complete film ….